A full-color design, a wide range of exercise sets, relevant special features, and an emphasis on graphing and technology invite your students to experience the excitement of understanding and applying higher-level mathematics skills. Graphing calculator instruction is provided in the Graphing Calculator Appendix. Each Graphing Calculator Exploration provides a unique problem-solving situation. 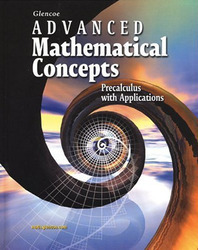 Calculus concepts and skills are integrated throughout the course.